Size matters in modern rugby. If all else is equal; speed, strength, endurance, and skill a coach will almost always choose the player with a couple of extra lbs. A little extra bulk will help you bust through tackles, prevent injuries (and the severity of injuries) and provide an intimidation factor. 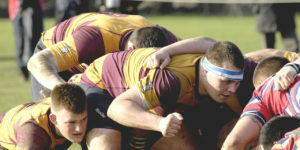 For the forwards, it’s also much harder to move a bigger guy in scrums and mauls. That’s just physics. So if size matters THAT much, you should train to get bigger, right? Wrong. Well, mostly wrong. If you talk to the best athletic trainers in the game of rugby, they’ll tell you it’s important to get strong first and let ‘big’ take care of itself. Unlike O-linemen for example, rugby forwards are expected to be able to move around the field for 80 minutes, perform a range of different strength movements in uncomfortable positions and do it all at varying intensities and speeds. That doesn’t sound easy because it’s not. The modern rugby player is built to handle and replicate explosive, powerful movements all game long. This requires functional strength and a lean physique. Unfortunately, many amateurs and those new to the game look at professional rugby players and think that because they’re so huge, they must train with a focus on creating size. Not true. Modern rugby players do very little, if any, hypertrophy training. You can see evidence of this in the fact that players have stopped getting bigger in recent years. For more on this checkout our article how to lean out for rugby season. If you’ve read through the excellent resource periodization in rugby, you’ll understand that rugby players do not and should not train the same way throughout the year. To maximize performance and prevent injuries, rugby players must taper their training according to the period of the season. The season is typically broken into three periods; Pre-Season, In-Season, and Off-Season. Today, as we discuss ways to gain both strength and size, we’ll be focusing primarily on the Off-Season and Pre-Season periods. Pre-professional training protocols focused on the off-season period as a time for rugby players to add mass to their frames. And for most of us, it’s important to get bigger during off-season. When the season proper arrives, you’ll be training twice a week and playing on Saturdays and almost everyone is going to lose weight. That’s especially true for amateur rugby players. So adding some bulk before the season starts is usually a good thing. But very few rugby players need to execute hypertrophy training in order to get bigger. Gaining useless body-building muscle won’t give the average player the kind of size they’ll need to perform on the field. General ‘bulk’ makes you slower and less flexible. Neither of those are good things in rugby. Instead, most rugby players should use the off-season period to get stronger and let ‘big’ take care of itself with a couple of simple nutritional tweaks. One exception to this rule is if you play in the front row, where adding bulk especially around your neck and shoulders is highly-advisable. For everyone else, you probably shouldn’t be training to get bigger. On his elitefts.com blog, world-renowned strength and conditioning coach Ashley Jones explains that his programs are designed to make rugby players strong. Jones’ programs use heavy peak power exercises and lower body plyometrics in combination with banded movements. Our rugby leg workout uses the same principles but also restricts rest periods to replicate a half of rugby throughout the session. Before you think programming, there are four training principles to consider when training for strength. Most rugby players do not need to be able to do a moderate intensity exercise hundreds of times. We’re not running an endurance race of competing in a crossfit challenge. We need to be able to perform a high-intensity interval dozens of times during a game of rugby. Jones’ advice is to stop doing sets of 8-12. In order to replicate a rugby game in the gym, your strength program should include lifting weights at or above 80% of your 1RM. But you’ll also need to be able to replicate this effort many many times. The ideal rep range for most rugby players in pre-season should be 2-4 and no more than 5. The ideal number of sets should be 6-10 with as many as 15. An interesting addition Jones makes to many of his programs is the inclusion of sprinting. Often neglected by the forward pack as the realm of wingers and fullbacks, sprinting is actually one of the best ways to improve muscle-twitch response. This is the process that aids in tissue growth and repair. Since we’re not training for hypertrophy, sprinting will give you significant muscle health and strength benefits without adding useless bulk. Anecdotally, I stopped squatting over summer during our 3-month 7s program last year. You’d expect that I would lean-out because of all the cardio, right? I did a weigh-in after 8 weeks and was shocked to see that I had actually GAINED 5lbs during the period. Like the All Blacks’ diet, mine was pretty strict keto except for fruit before training. The only thing I can reasonably attribute the size gains to was the huge amount of sprinting we did. 20m, 40m and 60m intervals like those espoused by our S&C coach Marco Martinez. During a half of rugby you don’t have the luxury of packing a scrum, lifting in a lineout or sprinting down the wing when you’re fully rested. In fact, you’re likely to have to do these things one after another when you’re tired and out of breath. Train that way too. Restrict your rest as much as possible by keeping your lifting intervals constant. E.g start a new set every 2 or every 3 mins without variation. This forces you to replicate high-intensity efforts which is exactly what you’ll be doing in a game. Try as best you can to maintain “active” rest by walking around and stretching between sets. But make sure you’re back under the bar before the buzzer goes for the next set. So how strong do you need to get and when should you stop your strength training in favor of another kind of workout? That’s hard to say since there is so much variation in rugby positions, levels and players. 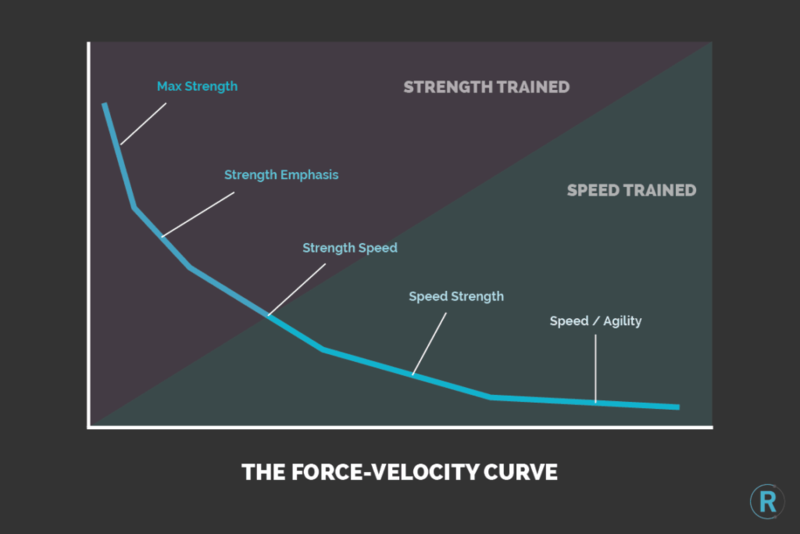 But a good guide is to look at the force velocity curve and base your training on the areas of the curve where you have a weakness. Jones suggests that your training should begin at Max Strength and Strength Emphasis (as we’ve explained above). But once you get strong enough to squat about 2x your bodyweight (2xBW), its probably time to move on to another area of the curve. Eventually you’ll hit that 2xBW mark on your Squat and Deadlift. It won’t be anytime soon mind you. But once it happens and your training needs to shift, focusing on the strength-speed and speed-strength areas of the curve would be ideal. This kind of training is outlined in our lineout strength and speed program, published a few weeks back. It includes both olympic lifts in the form of the “clean and press” and plyometrics in the form of the burpee. As with all our programs, there’s a restriction on rest intervals to train your body to recover fast and perform again. This is the kind of program you can move on to once you’ve started to see diminishing returns in your strength training. You don’t necessarily need to get all the way to 2xBW. Injuries, age, flexibility and time might all cause you to fall short of that target. But once strength gains start to slow down, you can think about moving on. Below, you’ll see a general guide for the kinds of training that are applicable to each area of the curve. Understanding the curve is key to training effectively. Creating power is crucial, but the power formula requires more than just strength. Don’t get sucked in to doing strength work all year, make sure you shift periodically. 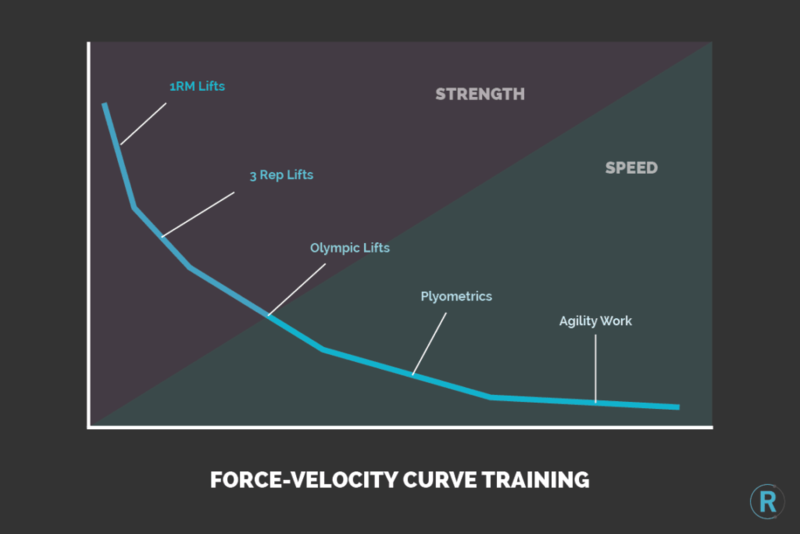 For more on how the force-velocity curve applies to rugby, checkout this great article by our partners at Rugby Renegade. We advocate against training to get bigger. But we also say that size is important and desirable in the off-season. Sounds like a dichotomy, right? Not if you eat properly. Here are a couple of simple ways to eat for strength. They’re not full diet programs, but if followed, these rules will give you a great framework for eating to get stronger. Muscle is built with protein. Protein comes from animals (mostly). In the off-season, you should be eating a whole protein source at every meal; beef, pork, lamb turkey etc. Because we advocate using ketogenic diet principles, we suggest eating as much fish as possible for the Omega-3s and good fats. Sardines and salmon are about the best things you can put in your body. Some people will tell you to ignore the warnings about cholesterol. Don’t do that. Cholesterol is a real thing and egg whites are straight-up better for you than egg yolks at breakfast time. Most professional rugby teams have massively reduced their carbohydrate intake in recent years. While they haven’t gone full keto, they now suggest you eat more healthy fats and fewer carbohydrates. But you’ll still need to have carbs at some point. In order to maximize gains in strength, we suggest eating fruit post-workout only. Your body has more than enough energy in it to conduct a strength training session. You don’t need 700 calories of strawberries before you go to the gym. But having a banana straight with your whey protein after your session to replenish your potassium levels and avoid cramping is fine, just fine. Outside our range of supplements for rugby players, we recommend three off-the-shelf products that can help you gain strength without any extra work in the gym. Vitamin D – taking it won’t necessarily make you stronger, but its important to maintain your levels of Vitamin D regardless. Several studies, like this one, have shown that Vitamin D deficiency can cause sub-optimal skeletal muscle function impacting athletic performance. Calcium – is critical for maintaining bone density. Bodybuilders have long used calcium to support size gains, but its equally important to have healthy bones when you’re looking to lift more weight. Even though we don’t advocate hypertrophy training, there is one trick we recommend if you’re looking to add mass during your strength training protocol. The hardest part about putting on weight is the eating part of the program. But let’s say you’re already eating 5 meals a day with meal replacements and whey protein thrown in. When do you find more time to eat? Here’s the pro tip: Put a protein shake in the fridge before you go to bed, set an alarm for 3am, get up and drink it. The challenge with this is that come breakfast time, you’re not going to be as famished as you usually are. Push through that. Eat a full breakfast and continue on with your regular eating habits. By using this strategy you’ll be cutting your 8hr food-free night into two 4hr blocks. Your body will get valuable re-building fuel while you’re sleeping and is you use our other recovery supplements, you’ll wake up with less muscle soreness too.